The Dutch arrived at Bantam in 1596, six years before the English--a pattern that was to be repeated for the next 80 years. Their United East India Company, or VOC, of 1602 began with 10 times the capital of the English East India Company and easy access to the manpower of North Germany and the Baltic. Almost everywhere the English Company went in its efforts to purchase Asian goods at source and to compete alongside existing Asian networks of trade, it found the Dutch already there, with more ships, more men, more money and a far more focused national purpose. As early as 1601 the Dutch had demonstrated what lay ahead when they smashed a Portuguese fleet in a full-scale naval battle in the Bay of Bantam. 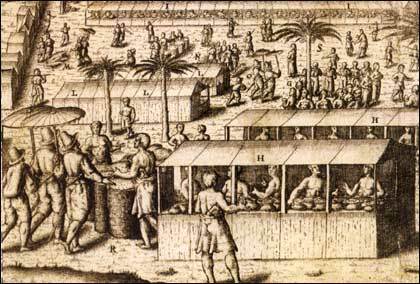 Portuguese merchants, whose pepper purchases had been important in the growth of Bantam, abandoned the city. Cloves sold in Europe for at least three times the price of pepper. Nutmegs and mace were even more expensive. It soon became clear that the newly formed VOC intended a complete take-over of the European trade in fine spices and that it would do whatever necessary to squeeze out the English Company and the remnants of Iberian influence. The method was both simple and ruthless--to seize control of the sources of production. The spice islands of the Banda group (Lontor, Neira, Api, Ai and Run), the intervening Buru, Ceram and Amboina, and the Moluccas (Batjan, Makian, Tidore and Ternate) were ruled by independent local kings and chieftains, most of them hostile to each other. The VOC embarked on the classic ploy of offering 'protection' against all enemies to individual rulers in return for treaties guaranteeing that their spice crops would be sold only to the Dutch. Selling to others was a breach of treaty, justifying immediate armed occupation. In 1605 the VOC built a massive fort on the clove island of Amboina, from 1607 the Sultan of Ternate was their puppet, and in 1609 came another large fort on Banda Neira. The British Library Map showing the spice islands and the nearby trading world of the seventeenth century. Buru lies to the east of Ceram with the Banda group of tiny islands due south in the Banda Sea. Map drawn for Trading Places by John Mitchell. English trading attempts were routinely obstructed by Dutch ships, forts and garrisons. They were unable to offer effective counter-protection to the spice producers; indeed any promises made were soon broken and served as pretexts for Dutch reprisals against the island populations. In October 1616, in desperation at what had happened to their world, the Bandanese of Run ceded their island to the English Crown. The VOC moved from threats to open hostilities. Seven English ships were captured and the Company's chief commander, John Jourdain, was killed on the deck of his ship off Pattani by a Dutch sharpshooter during truce negotiations in July 1619. In the same year, the VOC's newly appointed Governor General, Jan Pieterszoon Coen, took the decision to make their small post at Jacatra, east of Bantam, the main rendezvous for Dutch trade. Javanese resistance was crushed, Jacatra was destroyed, and the castle and city of Batavia began to take shape. Batavia, now Jakarta the capital of Indonesia, became the headquarters of the VOC's operations throughout Asia, in imitation of Portuguese Goa. ion of 8,000. Soldiers, overseas Chinese settlers, migrants from Europe, and slaves bought in Madagascar, India and the islands poured in to create a Dutch colonial settlement. Meanwhile the English Company had finally managed to put together a large fleet of 15 ships and was prepared to challenge the VOC. But just as a naval battle was imminent, news arrived in March 1620 that agreement had been reached in Europe for the two Companies to share purchases and expenses in Asia. It reached far-away Run too late to prevent the surrender of the island to the Dutch of Banda Neira, after a siege of more than four years. A period of half-hearted co-operation ensued. Under the terms of the agreement the English moved from Bantam to Batavia. An ironically misnamed Anglo-Dutch Fleet of Defence came together to attack Portuguese shipping off the west coast of India and to blockade Spanish Manila, where the opportunity was also taken to plunder Chinese junk traffic. Such co-operation was, of course, totally at odds with Coen's designs and in any case proved short-lived. The English Company could not sustain its share of the expenses and the status of Run remained in dispute, while in 1622 the VOC ships in the combined East Asia fleet launched their own separate, though unsuccessful, attempt to capture Macao. Worse was to follow. In February 1623 Gabriel Towerson, English chief on the clove island of Amboina, and nine other Company servants (together with nine Japanese samurai mercenaries, some of them from Hirado, and a Portuguese) were executed by the Dutch Governor Herman van Speult on a charge of conspiracy to seize the fort there. The proceedings were marked by horrific tortures to extract confessions and it is likely that the `plot' was a convenient fabrication designed to drive the English permanently out of the spice islands. The news caused uproar in Europe. Pamphlets replete with gory frontispieces and titles beginning A true relation of the unjust, cruell and barbarous proceedings against the English appeared in London, to be refuted in turn by publications from Amsterdam, but the affair was never settled and joined that of Run to bedevil Anglo-Dutch relations for two generations. Soon after the English Company withdrew from Japan and mainland Southeast Asia. An attempt to settle on the island of Lagundy in the Straits of Sunda in 1624 was thwarted by disease and it was not until 1628 that the English shook themselves free from Dutch supervision and moved back to Bantam. Access to the spice islands was now firmly closed. 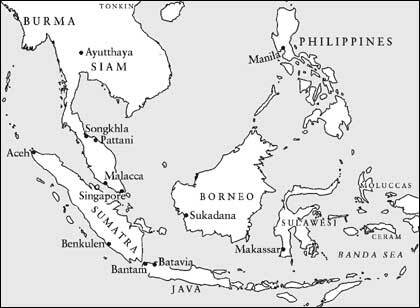 The English concentrated on the pepper trade of Bantam and southern Sumatra, while at the same time opening contact for fine spices with Makassar, on the southwestern arm of Sulawesi, whose intrepid Bugis seafarers continued to visit the islands in defiance of the Dutch. This loophole was not closed until 1667, when the VOC occupied Makassar and forced its ruler to exclude all other Europeans. 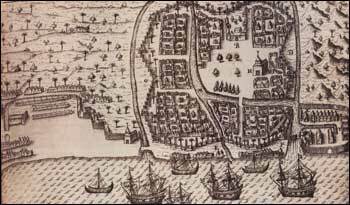 Bantam and Batavia continued an uneasy relationship, punctuated by the VOC capture of Malacca in 1641 and the three Anglo-Dutch Wars of 1652-54, 1665-67 and 1672-74. Whatever their outcomes in Europe, in Asia the English invariably saw their ships captured and their Bantam trade interrupted. The Treaty of Breda at the end of the second war did, though, resolve the problem of Run. In return for the British Crown relinquishing its claim to Run, the Dutch handed over their New Netherlands settlement, based on the island of Manhattan, which had long been an irritant to the colonialists of New England. The final VOC triumph came in 1682. Abu‘l Fatah, the 'old' Sultan of Bantam, who had resigned his throne under pressure from his son, Sultan Abdul Kahar, two years before, resumed the government by force. Fulfilling one of the conditions for Dutch assistance, the English factory was ordered out and its personnel evacuated Bantam on 11 April. News of their expulsion reached London in mid-March 1683. Preparations to meet force with force began but were soon abandoned, and it looked as if the VOC would succeed in excluding its rival from the trade in Indonesian pepper as well as fine spices. Pepper had been the most important single commodity of the Company's trade for most of the seventeenth century. The quantities imported were enormous, for instance more than 3,175,200 kgs in 1677, and much of what was sold in London was re-exported to markets as far away as Poland, Russia and the Ottoman Empire. Although profit margins were small, the sheer volume of the trade coupled with its historic associations as the 'foundation commodity' made the English determined to keep market share as a matter of national pride and a sign of resistance to the VOC's ambitions. Most of the pepper shipped from Bantam originated in southern Sumatra. Efforts to find an alternative regular supply were now concentrated there. In 1685 the English negotiated a settlement at Benkulen, on the southwest coast near the important pepper-collecting area of Silebar. Despite Dutch attempts to intimidate the local Rajas under cover of suzerainty claims by their client Sultan of Bantam, pepper began to come in--the ship Williamson loaded 226,800 kgs of the spice in October 1689. After an 80-year history of broken promises to local rulers in Indonesia, the English had finally come to stay. Benkulen, supplemented by supplies from Malabar and later from Madras, remained a major source of pepper throughout the eighteenth century, regularly sending between 453,600 and 907,200 kgs per year to London. In 1825 the settlement was handed over to Dutch control in exchange for Malacca. By the end of the seventeenth century the balance between the two Companies began to shift. It was the English, under their new Dutch king, William III, who were more enterprising, aggressive and self-confident, while Holland's real position as a small country facing competition on all fronts from much larger neighbours was becoming apparent. The reasons for the `decline' of the VOC have been much debated and have been variously attributed to the corruption of its servants, the growing conservatism of its Directors, and the loss of its edge in shipbuilding. Following the catastrophic effects on Dutch seaborne trade of the fourth Anglo-Dutch War of 1780--84 and then the French Revolutionary invasion of the Netherlands, the VOC was dissolved on 31 December 1795. Certainly with hindsight its concentration on Indonesia and its Batavia headquarters proved to be a mistake. Wealth and power lay elsewhere in Asia, as the English were soon to discover. This session is adapted from pp.48--53 of Trading Places: The East India Company and Asia 1600-1834 by Anthony Farrington, published by The British Library, 2002.